The third weekend is October has meant it’s time for the Denver Marathon. When it was announced that this year would be the inaugural Rock N Roll Denver Marathon, I was excited. Geoff participated in a Rock N Roll Marathon in San Diego (2005) and liked the feel of it. I knew if my friend Cristina was looking for another relay partner, I’d volunteer myself. 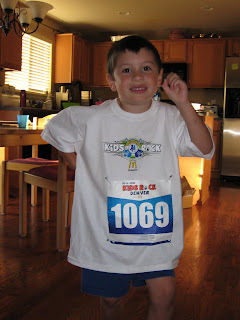 We asked Elijah if he’d like to run in the Kids Rock race, the day prior to the marathon. He seemed keen, and we put off signing him up. This worked to our advantage because Mile High Mamas offered free entry for the first 50 kids to use their code. Sweet! Elijah woke this morning with a croup-sounding cough, but had no other complaints. We decided to let him eat his breakfast and chill out before we would see if he would be up for running. He wanted to go, so we grabbed everything we needed and headed downtown. We made our way to Civic Center Park, and found where we needed to wait for the Kindergarten division to start. I was nervous, because we had only 30 minutes from us parking to find the race start. I didn’t need to worry, when we got there at 9:20 for his 9:45 start, they were only finishing the 3rd graders. We still had 2nd & 1st to go through. Elijah made friends with another Kindie waiting to race, and eventually it was time for him to warm up with all the Kindergarteners. Miles & I found a spot to watch the half mile race, and waited anxiously for him to start. Daddy waited near the start line to encourage Elijah and then joined us once Elijah got going. It was exciting to cheer for my boy, and he worked hard. 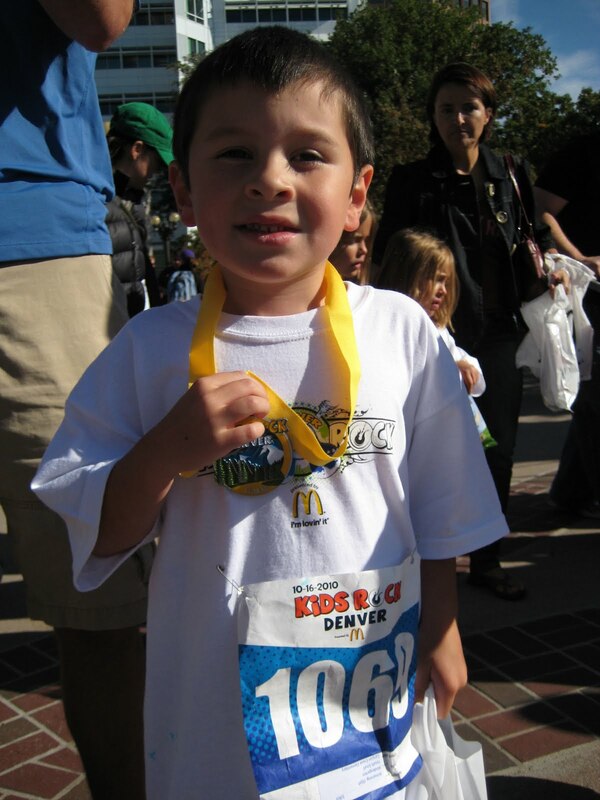 He was thrilled to receive his first medal, and fill up his goodie bag before joining us at the end of the corrals. Geoff said Elijah was sure to ask them if the stuff had sugar in it before taking it. 🙂 That’s my boy! At the end of the corrals, his fans were there to greet him, Daddy, Mommy, Miles, Cristina & Eric. It certainly was a good day for running. My kid rocks! Realized yesterday that I hadn’t blogged in weeks. And it’s not because I’ve been crazy busy, rather that life has been calm and relatively uneventful. Miles & the bully update: haven’t seen the kid go near Miles since Miles stood up to him. I did scour Elijah’s school directory, and discovered the boy is in Kindergarten. Thanks to everyone who gave support and comments on the issue. Miles & speech therapy: If you could pray for it to move along a little quicker, that would be great. Right now he’s only seeing the speech therapist twice a month, but obviously that is not going to cut it. His teacher Ms. Kim said I should expect to hear from the Child Find people around mid-November, to discuss the evaluations. We’re continuing to help him as best we can at home. We’re off to Nick’s Garden Center today for a preschool field trip. Elijah has no school today so he’s crashing the field trip. Also on today’s agenda is to make some progress on Elijah’s costume. Yesterday was the 7th anniversary of losing Dad. I listened to 60s music and Motown. I still really miss him. Now you are up to date. I really didn’t think that bullying was going to become an issue. Naive on my part, I’m sure. But to be able to witness it, and fight the urge to jump in to my kids defense has been hard. We haven’t even really talked about it, or played through scenarios on how to handle it. When Miles & I come to school to pick Elijah up, we always stay and play a little on the playground. There are two play structures, one for small kids and one for bigger kids. They are separated by a blacktop, so I can’t watch both areas at the same time. Which is okay, both boys want to be on the bigger play structure. On Monday, an older boy, probably first grade, maybe second grade, saw Miles playing and confronted him. He mocked Miles’ t-shirt, called him a baby and laughed saying he wears diapers. Miles defended himself, but ultimately ran to Elijah to tell him what the boy said. Elijah proceeded to get in the kid’s face and say, “my brother is not a baby, he’s 3. He doesn’t wear diapers”. The kid blew him off, and I told Miles just ignore him, play somewhere else. Wednesday afternoon, it was a repeat of Monday. He saw Miles, mocked his clothes, and called him a baby. This time, Miles gave him the evil eye and said “I hate you. You’re a meanie” The kid didn’t have a response, but he looked in Miles’ direction, Miles reminded him, I hate you. The boy retorted with “don’t call me a meanie. If I see you on this playground again and you say you hate me and I’m a meanie, I’m gonna tell your mom”. The kid was called away, and I told Miles, if you don’t want to be near that kid, just move away, play somewhere else. I can’t wrap my mind around why this boy is going out of his way to pick on Miles. I’m trying to walk the line between letting my kids fight their own battles, and being a helicopter mom. I open it up to you dear readers, any advice you can give, any similar experiences, please share it with me.